Turkey Hill is a leading brand of American ice cream for Food Service and Retail. 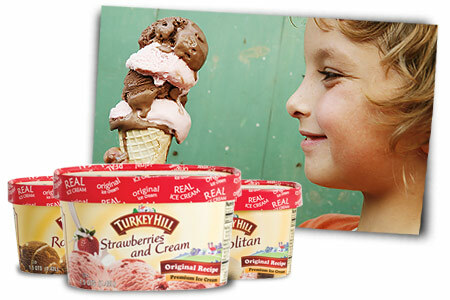 Get a good taste of Lancaster County lifestyle with Turkey Hill All Natural Ice Cream — churned with all natural ingredients and a little extra cream for unforgettable richness. Indulge in ribbons of confectionary delight, with new Turkey Hill Gelato Swirls. Extra ripples of flavor make for an irresistible dessert that is sure to satisfy your sweet tooth. Flavours: Brownie Fudge, Caramel Cookie, Caramel Peanut Butter, Mint Cookie Crunch and Raspberry Chocolate. Turkey Hill makes sure that each and every container of premium ice cream lives up to their name buy only using the best ingredients. Inspired by Italian gelato recipes, All Natural Gelato is made with simple, natural ingredients like fresh milk, cream, and real sugar. Flavours: Chocolate Chocolate Chip, Chocolate Peanut Butter, Coffee Chip, Hazelnut, Mint Chocolate Chip, Peach Mango, Purely Vanilla and Sea Salted Caramel.